reeman Heyne Toma – Financial Advisors is a full service advisory firm with offices in Strongsville and Cincinnati. Led by Managing Partner, Brian Toma, Freeman Heyne Toma helps individuals and small businesses plan for their financial future using a goal based approach to asset management. With six Financial Advisors and six Client Relationship Managers on staff, FHT Advisors is built to deliver a top notch customer experience. “Our clients come from all walks of life and the experience of our advisors and our client service team places us in an ideal position to help meet our clients needs. When you choose to work with us, you benefit from obtaining comprehensive advice from a team of highly qualified and credentialed professionals who have successfully managed money through some of the most difficult times in history. As a team, we have over 100 years of combined asset management experience,” says Brian Toma. So what makes FHT Advisors different from other financial planning firms? Bear Rupert, Financial Advisor at FHT Advisors says, “It’s all about the client relationship and doing what’s right. 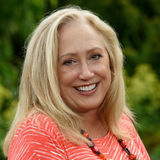 We love getting to know our clients and we do not take lightly the trust our clients put in us. When we meet with our clients, we dig deep to determine what their goals are which allows us to provide them with customized investment strategies to work specifically toward those goals. More importantly, we help our clients think for the long term and discuss the “what if’s” in life that may need attention during the planning process. Preparing our clients for their financial future comes down to so much more than just dollars and cents and that’s where I feel that we are really able to bring value to our client relationships.” (Left to right): Bear Rupert, CWS®, AIF® Financial Advisor; Brian Toma, CFP®, AIF® Managing Partner; Tom Dragar, CFP®, AIF® Sr. Client Relationship Mgr. Call 440-879-2912 for a Free Consultation • www.fhtadvisors.com • Located at 18400 Pearl Rd., Ste. B in Strongsville Securities and advisory services offered through Cetera Advisors, LLC, Member FINRA/SIPC. Freeman Heyne Toma LLC and Cetera Advisors LLC are non affiliated companies. 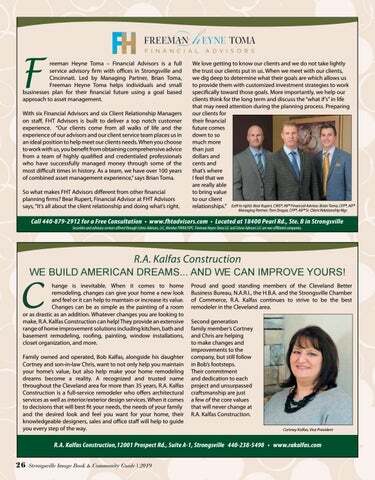 R.A. Kalfas Construction WE BUILD AMERICAN DREAMS... AND WE CAN IMPROVE YOURS! hange is inevitable. When it comes to home remodeling, changes can give your home a new look and feel or it can help to maintain or increase its value. Changes can be as simple as the painting of a room or as drastic as an addition. Whatever changes you are looking to make, R.A. Kalfas Construction can help! They provide an extensive range of home improvement solutions including kitchen, bath and basement remodeling, roofing, painting, window installations, closet organization, and more. Family owned and operated, Bob Kalfas, alongside his daughter Cortney and son-in-law Chris, want to not only help you maintain your home’s value, but also help make your home remodeling dreams become a reality. A recognized and trusted name throughout the Cleveland area for more than 35 years, R.A. Kalfas Construction is a full-service remodeler who offers architectural services as well as interior/exterior design services. When it comes to decisions that will best fit your needs, the needs of your family and the desired look and feel you want for your home, their knowledgeable designers, sales and office staff will help to guide you every step of the way. Proud and good standing members of the Cleveland Better Business Bureau, N.A.R.I., the H.B.A. and the Strongsville Chamber of Commerce, R.A. Kalfas continues to strive to be the best remodeler in the Cleveland area. Second generation family member’s Cortney and Chris are helping to make changes and improvements to the company, but still follow in Bob’s footsteps. Their commitment and dedication to each project and unsurpassed craftsmanship are just a few of the core values that will never change at R.A. Kalfas Construction.